The key of JBS Roofing Phoenix to happy customers and employees is to keep your commercial building cool at all times. During the hot summer months, this means that your HVAC system will need to work overtime. If your building makes use of rooftop HVAC units, there are several problems that can occur. These issues can adversely affect your commercial roof, which is why it’s important to keep each unit well maintained. Maintaining an HVAC unit that’s installed on a rooftop can be a difficult job for anyone, even for experienced technicians. Though unintentional, these technicians can cause an untold amount of damage to a commercial rooftop, which can be costly to repair. In order to ensure that the job goes according to plan and that damage to the roof is minimal at most, it’s recommended to have a professional on the roof during the job. This will provide you and your business with a peace of mind that your investment is protected. One of the biggest issues with rooftop HVAC units is with the condensation caused when the unit is running. This discharge of condensation will eventually build up and create pools of water on the roof of your building. This greatly increases risk of damage to the rooftop. Moisture in these areas can lead to such damage as mold and vegetative growth, as well as discoloration and staining. In severe instances of this issue, leaking can occur and damage the inside of your building as well. Thankfully, this issue can be mitigated either by using interior discharge lines or through the installation of discharge lines that move the excess water to a nearby roof drain. It’s important to note that this water is supposed to be vaporized when still within the HVAC unit, but can sometimes pool if the unit is old and faulty. 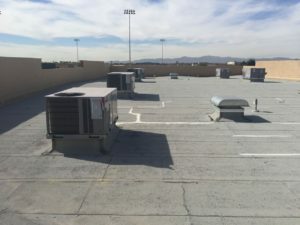 When it comes to the rooftop of a commercial building, the time to install additional HVAC units is when the rooftop is first being constructed. This ensures that the designs are made in a way that incorporate extra HVAC units through the installation of tubing, curbs or drainage lines. If you decide to wait and add units once the roof has already been constructed, there are several issues that can lead to the damaging of your rooftop. For instance, a unit that’s been installed incorrectly can create adverse wind uplift around the separation site, while areas where extra units are installed might not be built to handle the extra load, which can place undue strain onto the roof. This is especially dangerous during the winter season when snow has built up on the roof. This issue can be alleviated through the installation of these units during the construction phase. If this is no longer possible, make sure to consult multiple contractors to ensure that the rooftop can handle the extra load. In order to best minimize the risks associated with rooftop HVAC units, there are several steps you can take. For one, make sure that any useful accessories such as sealants and curbs are installed properly. 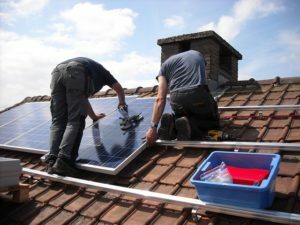 When the unit is installed, it’s essential that a rooftop professional is on hand at all times during the process. Problems with HVAC units can be very sudden and difficult to identify before they happen. However, regularly maintaining the unit will ensure that these small issues don’t eventually turn into larger ones that could cause damage to your rooftop as well. Don’t hesitate to contact JBS roofing for advice or assistance in making sure that your commercial roof is up to standard for the installation of an HVAC unit.